The Mature Mouse™ has just learned that Walt Disney World will be offering a new 4-park ticket in 2019. Blow is a reprint of the news from Disney Parks Blog. As we turn our calendars to 2019, our thoughts turn to new year’s resolutions. Now, more than ever is the time to get away from it all and spend time with friends and family, making memories that last a lifetime. A visit to Walt Disney World Resort is the perfect place to make these resolutions turn into reality, and special 4-Park Magic Tickets will help you experience the new fun and excitement heading to all four theme parks this coming year. Starting Jan. 18, 2019, you can purchase 4-Park Magic Value Ticket for $85 per day, plus tax (total price $340, plus tax) that include one day of admission to Magic Kingdom Park, one day of admission to Epcot, one day of admission to Disney’s Hollywood Studios and one day of admission to Disney’s Animal Kingdom, for a total of four admissions over four separate days*. The 4-Park Magic Value Ticket is valid for admission Jan. 18 – March 1, 2019, and must be used within seven days of first use or by March 1, 2019, whichever comes first. 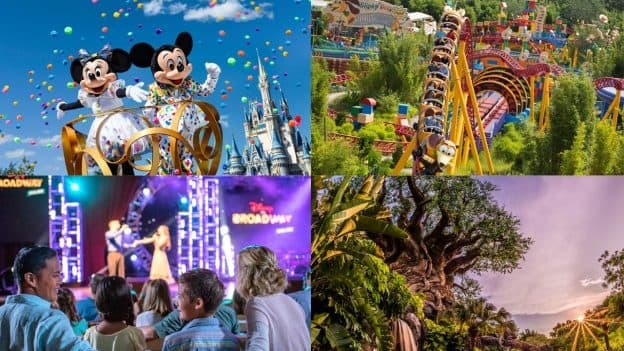 Two additional types of 4-Park Magic Tickets will also be available at higher price points and may be used on various dates through Sept. 30, 2019. For more information about the 4-Park Magic Tickets, visit Disneyworld.com/parkmagic. Pixar pals will party with guests at Disney’s Hollywood Studios during the park’s 30th anniversary year, featuring The Incredibles, Mike and Sulley from Disney•Pixar’s “Monsters, Inc.” and Woody, Buzz Lightyear and the gang at the new Toy Story Land. To celebrate the 25th anniversary of the Disney animated classic “The Lion King,” Rafiki and Timon will help guests let their inner animal loose on the dance floor during the “Hakuna Matata Time Dance Party” at Disney’s Animal Kingdom. *One theme park per day and the tickets can be used to enter each theme park only once. Tickets are non-refundable and non-transferable and exclude activities/events separately priced. Higher-priced tickets are valid for use on dates with a lower price. For more information about the 4-Park Magic Tickets, visit Disneyworld.com/parkmagic. Next > WDW offering Free Dining in 2019!